If enough gates open, eventually the Ancient One's doom track will fill up with doom tokens, even if the investigators use all of the elder signs. When a doom token is placed on the last open space on the doom track, the Ancient One awakens immediately. If the investigators allow too many gates to be open at the same time, this can awaken the Ancient One. The number of open gates that will immediately awaken the Ancient One depends on the number of players. Finally, the Ancient One awakens immediately when a new gate opens and there are no unused gate markers left in the pile. Thus, if gate markers run low, players should spend one or more gate trophies to replenish the supply. The Ancient One also awakens if a monster should be drawn from the monster cup, but there are no monsters in the cup. 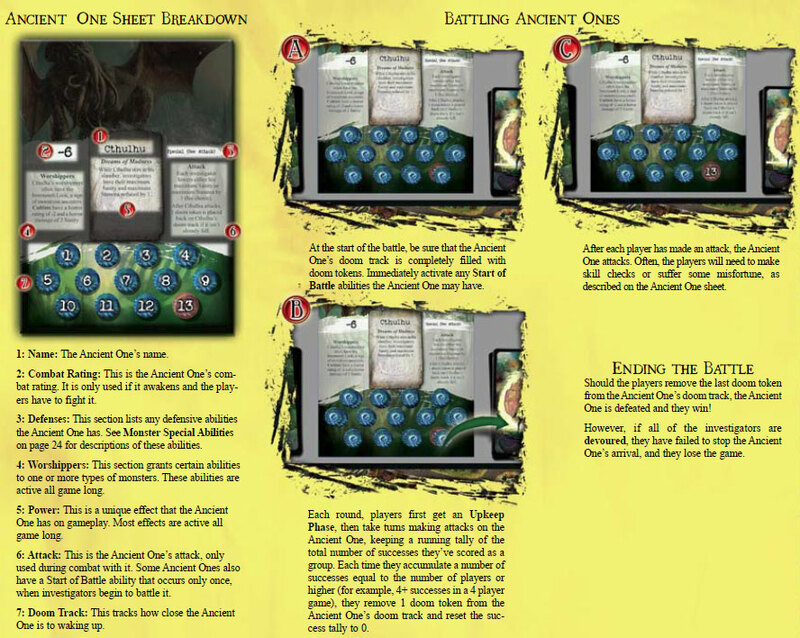 The Ancient One also awakens if the terror level has reached 10 and there are monsters in play equal to twice the normal monster limit (for example, 16` monsters in a five-player game). Very Important: If the Ancient One awakens and its doom track is not full, fill its doom track with doom tokens before proceeding to the final battle. When the Ancient One awakens, any investigators that are lost in time and space are immediately devoured and eliminated from the game. The surviving investigators must face the Ancient One in the final battle! Before the final battle begins, discard any active Environment or Rumor cards. Additionally, once the final battle begins, investigators should no longer collect money or roll for Retainers or Bank Loans. 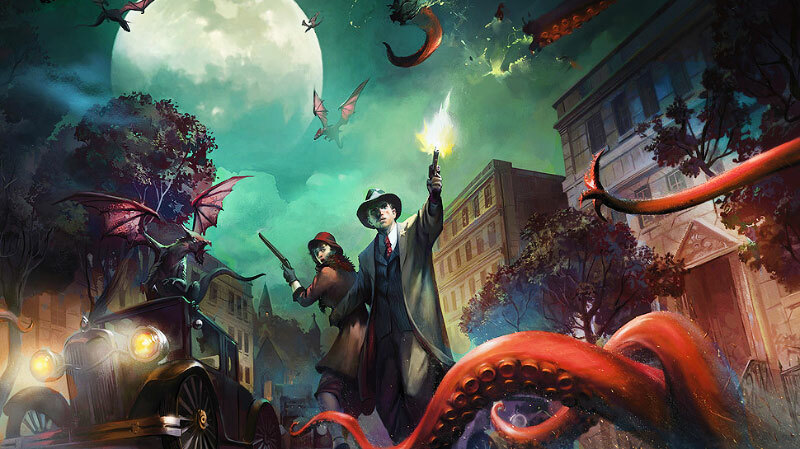 At the beginning of a round of combat with an Ancient One, the investigators may refresh their cards, use any character abilities, and adjust their skill sliders as though it were the Upkeep Phase. Next, the first player marker should be passed to the left. Finally, they may trade items among themselves as if they were in the same location. 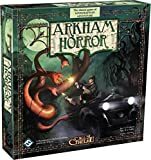 Next, starting with the first player and continuing clockwise around the table, every player whose investigator is still participating in the battle may make a Combat check against the Ancient One using its combat rating as the modifier. Unlike a normal battle, the Ancient One cannot be defeated in a single attack. Instead, keep track of every success an investigator scores against the Ancient One. These successes are cumulative, and each successive player adds to them with his own attack. When the players accumulate a total number of successes equal to the number of players (including any players that were eliminated from the game), remove one doom token from the Ancient One's doom track and reset their cumulative successes to zero. If the last doom token is removed from the Ancient One, the investigators have defeated it! After all of the players (except eliminated players) have made one Combat check against the Ancient One, the Ancient One unleashes its attack on each of the investigators. This attack varies by Ancient One, but they are all extremely deadly. For example, Hastur forces all the investigators to make an increasingly difficult Will check or lose Sanity. Any investigator reduced to 0 Sanity or Stamina by the Ancient One's attack is devoured. If an investigator is devoured during the final battle with the Ancient One, that player is eliminated from the game (i.e., the player does not draw a new character). If all investigators are devoured, the Ancient One is unleashed on the world and the players lose the game. After the Ancient One's attack is resolved for each investigator, a new round begins. This continues until either the investigators defeat the Ancient One or all have been devoured.